I posted this comment to Tim Post asking about what constitutes as being a new contributor. I searched on Google for "what is a new contributor Stack Overflow meta" and "what is a new contributor" in the search input on Meta Stack Exchange, but I came up empty. Here is what I don't understand. I noticed this answer from this member this morning and there is the "New contributor" message showing up under their member name in the answer. Shouldn't that be showing for "new" members only who have not contributed in any way, be it a question or answer? The description under: "The new indicator works by the age of a user's first visible post." 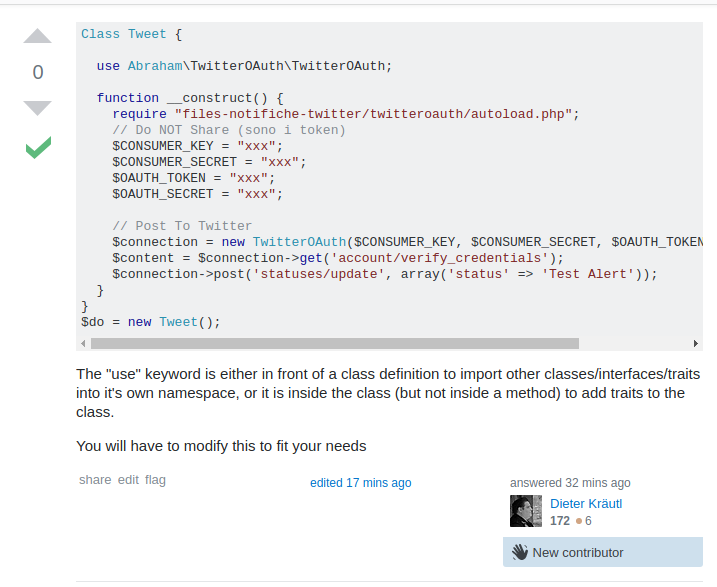 in the Meta Stack Exchange post Come Take a Look at our New Contributor Indicator! being "This could be a question or answer," to me doesn't seem to fit the bill here. If it's an "or", then why is that "New contributor" message showing in their answer under their member name? What "does" constitute as being a "New contributor"? Is this a bug or is it because they have not asked any questions yet and have only contributed with answers? They have been a member (on Stack Overflow) for 58 days now (as of today). I took a screenshot of what I saw just in case it disappears. About the possible duplicate: I feel it does not answer my question since I have seen the "New contributor" message show up only for new members lately who have posted new questions or answers, not for ones that have been here for a while. Users are considered "new contributors" for one week (7 days) after their first post, regardless of when the account was registered. This specific user has no questions and their oldest answer is from only 2 days ago. This means they meet the criteria for being a "new contributor" even though they have 22 answers within these 2 days. It's all about the recency of the first post (whether it's a question or answer), not the volume of activity. And it will continue to appear on all things related to this user for the entire week. Not the answer you're looking for? Browse other questions tagged support new-contributor-indicator . Can Moderators Modify Bounty Text? What is that “New contributor” icon supposed to be?